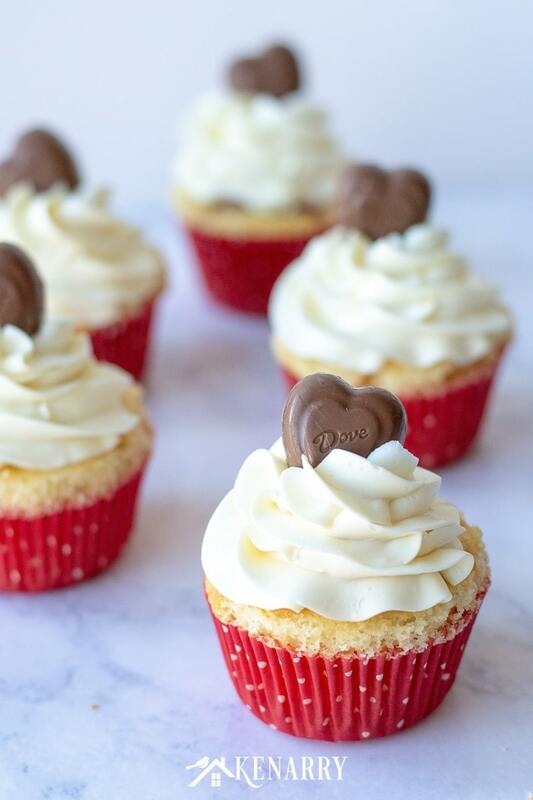 Surprise your sweetheart with festive Valentine’s Day Cupcakes. 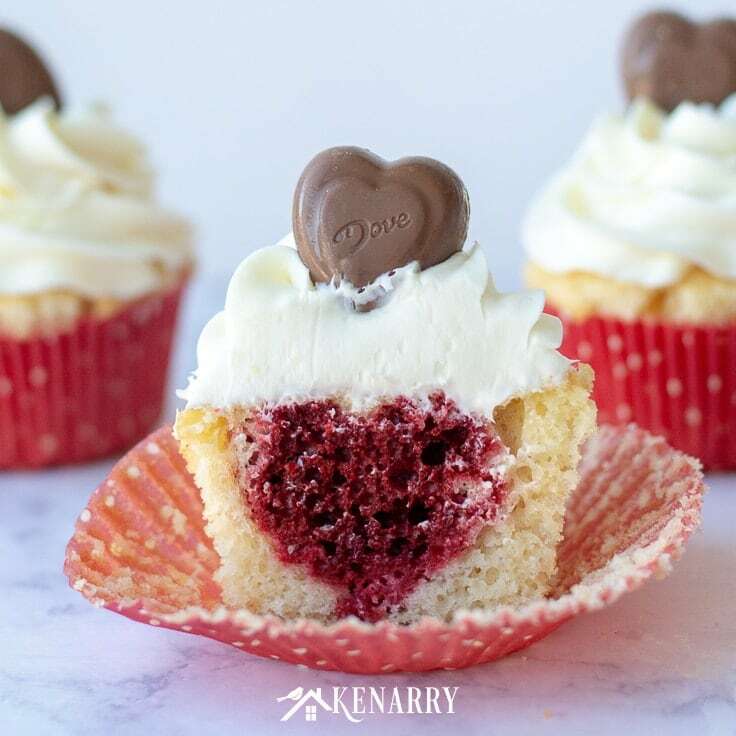 This fun dessert idea has a hidden red velvet heart inside each of these delicious treats. Are you looking for a special dessert idea to wow your sweetie this Valentine’s Day? 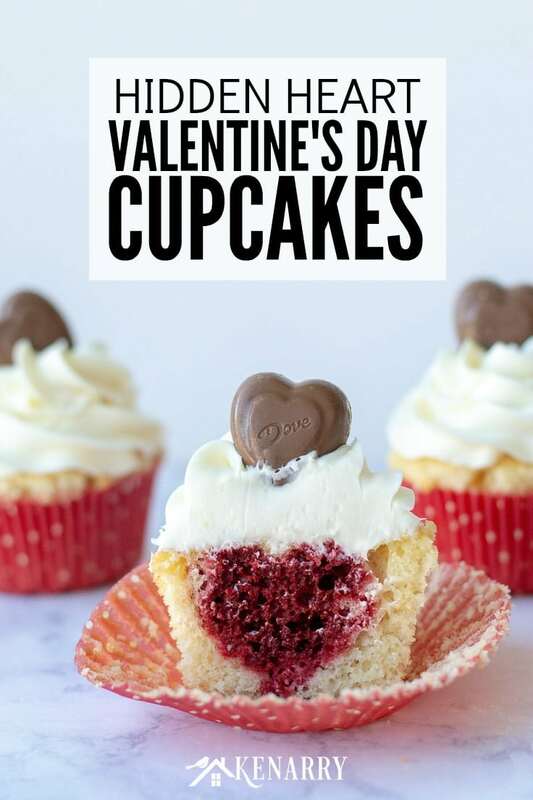 Try making these delightful Valentine’s Day cupcakes. 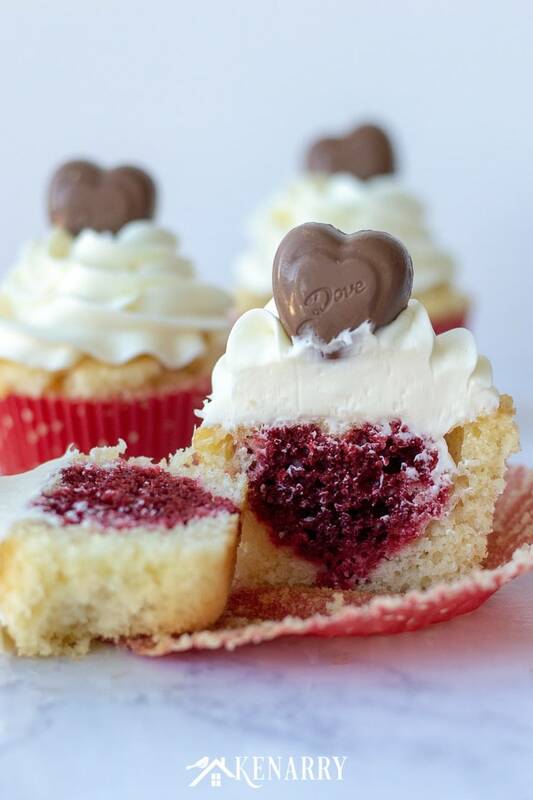 We’ll show you step-by-step how to hide a little red velvet heart in the center of each cupcake! Happy February! It’s the season of love, so today we’re celebrating with special holiday treats. Our friend, Meaghan from Cook. Craft. Love. 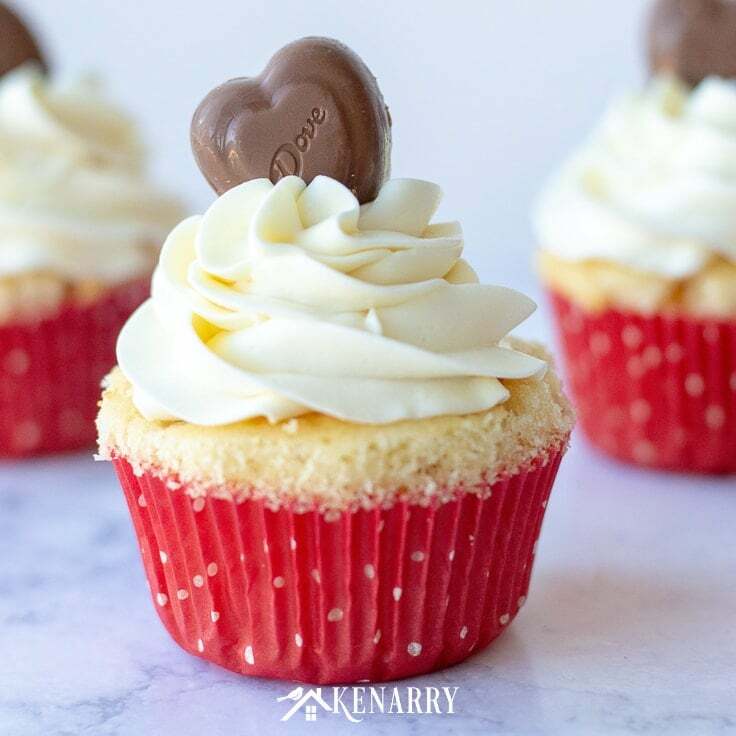 is back on the blog sharing her step-by-step tutorial for how to make Valentine’s Day cupcakes with cute little hearts hidden inside. When it comes to Valentine’s Day desserts, Meaghan has lots of great ideas, like her Classic Red Velvet Cupcakes, her Dark Chocolate Raspberry Whoopie Pies and her Conversation Heart Sugar Cookies. 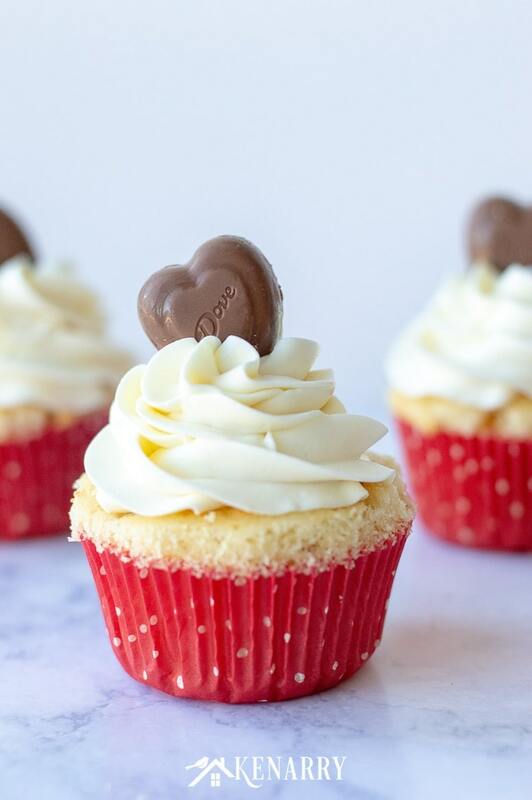 But these new Valentine’s Day cupcakes top them all with their hidden little secret inside! The Valentine’s Day cupcakes look like a normal mild-mannered cupcake on the outside, but one bite and ka-pow! SURPRISE! There’s a heart inside. 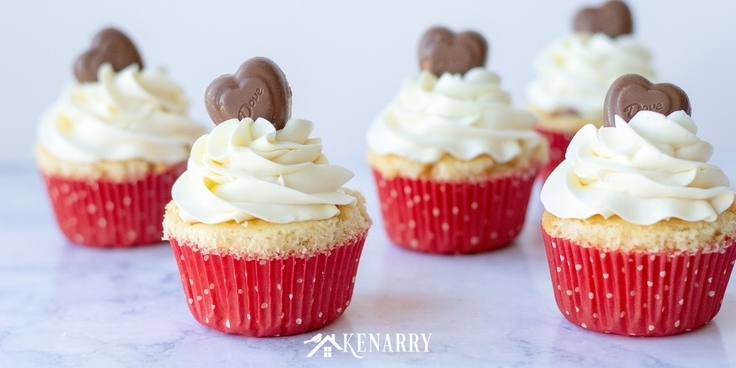 I love how each of these Valentine’s Day cupcakes is also topped with a chocolate candy heart. However, Meaghan says you can “sub out conversation hearts instead of chocolate if you prefer but the easiest way to know which way the hearts inside the cupcakes go is to add the heart decoration on top.” Just make sure you pay attention to which way the heart is facing when you’re frosting the cupcakes, then place the chocolate heart in the same direction. 1. Make the red velvet hearts. Preheat your oven to 350 degrees and grease a 10 x 14 inch jelly roll pan with cooking spray. Next, prepare your red velvet cake mix according to package instructions using a stand mixer or a hand mixer. Then pour the cake batter into the jelly roll pan. Bake the red velvet cake at 350 degrees for 14-16 minutes or until a toothpick inserted into the center comes out clean. Let the red velvet cake cool in the pan for 5 minutes and then transfer the baking sheet to the freezer for an additional 15 minutes to cool completely. When the red velvet cake is cooled, remove it from the freezer. Then using a small heart cookie cutter, cut out 24 heart shapes for the Valentine’s Day cupcakes. TIP: Don’t throw away the cake scraps! Meaghan recommends you use up red velvet cake scraps to make this delicious red velvet trifle. That’s her favorite way to eat cake scraps. However she also said you can use them to make cake pops, as a topping on yogurt, or for her second favorite way to use cake scraps: these ice cream sandwiches. 2. 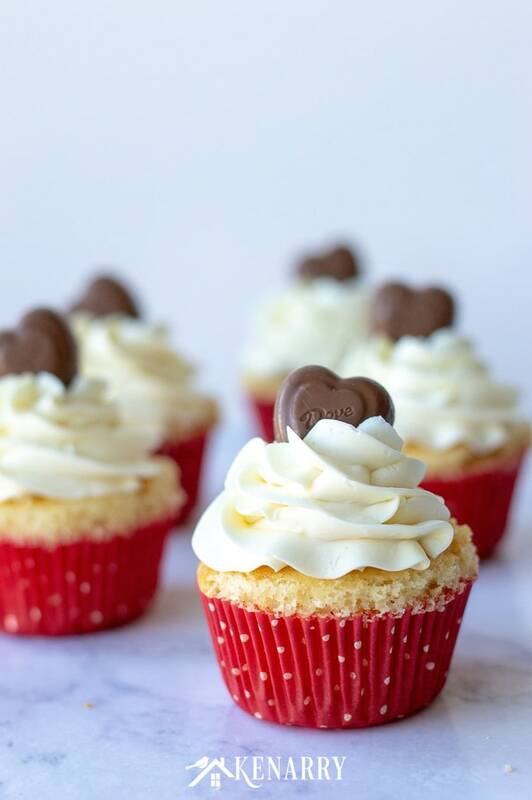 Prepare and bake the Valentine’s Day Cupcakes. While the red velvet cake is cooling make the white cake mix according to package instructions using your stand mixer or hand mixer. Next, line your cupcake tin with cupcake liners. Then spoon about a tablespoon of white cake batter into the bottom of each one. Put the rest of the batter into a gallon sized ziploc bag or large piping bag. Gently press a red velvet heart vertically into the center of each cupcake liner so the point of the heart is down. Don’t squish it! Then carefully pipe white cake batter around the heart until the liner is about 2/3 full. Pipe a little bit on top of the exposed heart to protect it from burning in the oven. Bake at 350 for 20-22 minutes or until a toothpick inserted into the white part of the cake comes out clean. 3. Frost the Valentine’s Day Cupcakes. Once the Valentine’s Day cupcakes have cooled completely it’s time to make the frosting. Using a stand mixer or hand mixer, beat the softened butter and cream cheese until it’s well blended and creamy. Now add the powdered sugar using only 1/2 a cup at a time until the frosting reaches a creamy consistency for piping. Then add the vanilla and mix the frosting until combined. 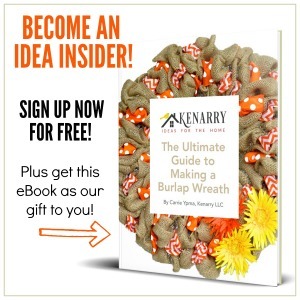 Drop a star tip into the bottom of a piping or cake decorating bag. 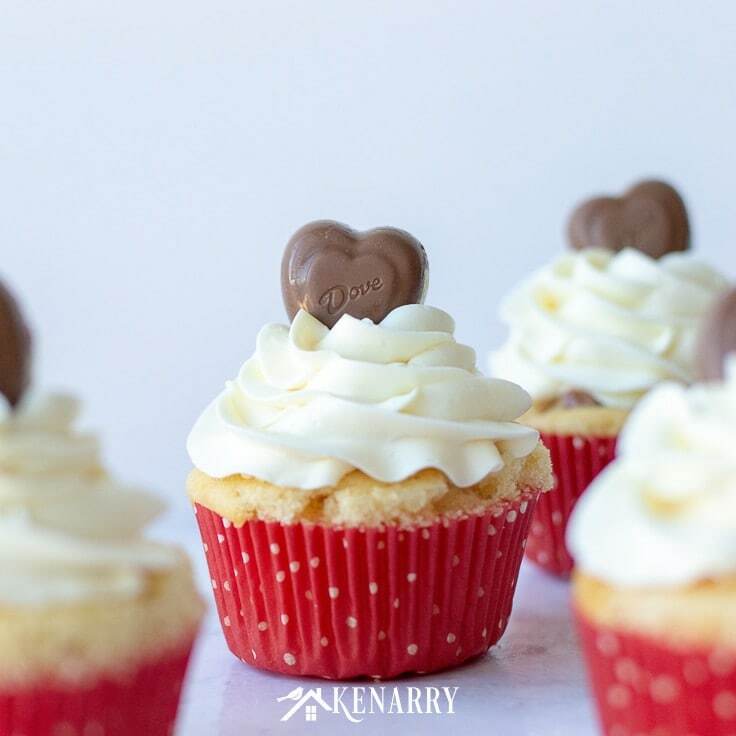 Frost each of the cupcakes with a star tip, paying careful attention to the direction of the red velvet heart. 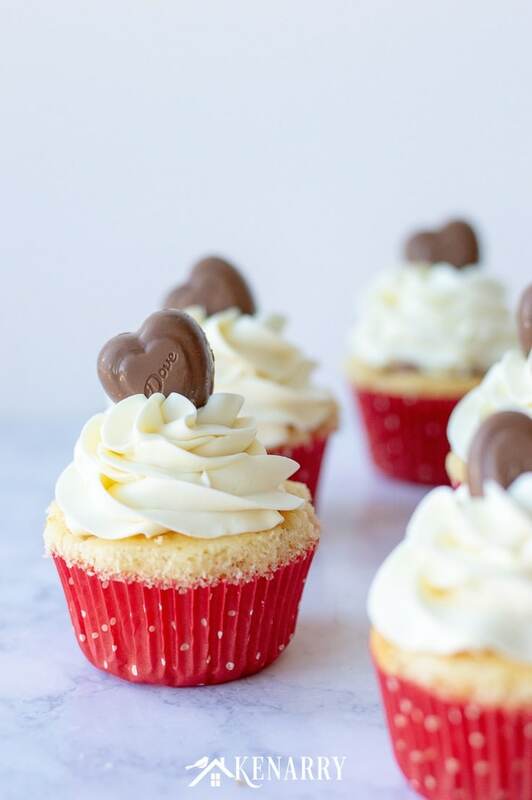 Finally, place a chocolate heart on top of each cupcake so it lines up with the placement of the red velvet heart. 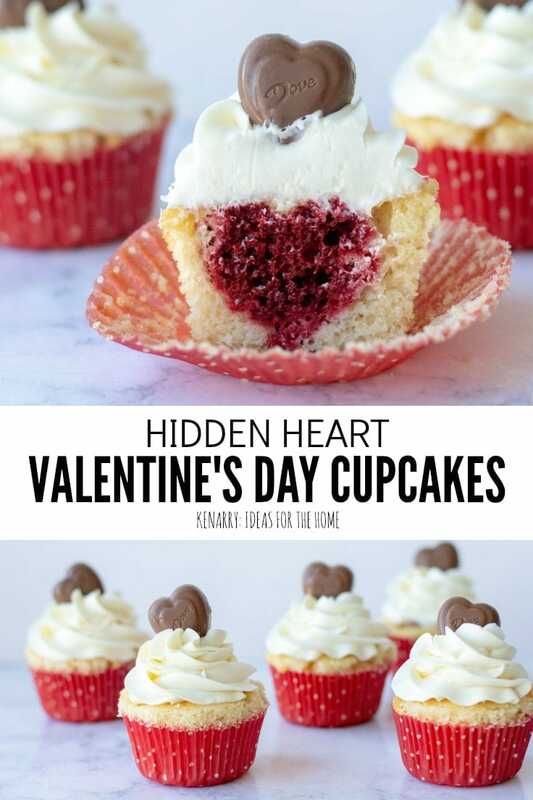 This way you’ll know how to cut into the Valentine’s Day cupcake to show your sweetie the hidden heart. Enjoy! Preheat your oven to 350 degrees and grease a 10×14 jelly roll pan with cooking spray. Prepare your red velvet cake mix according to package instructions and pour it into the jelly roll pan. Bake at 350 degrees for 14-16 minutes or until a toothpick inserted into the center comes out clean. Let the cake cool in the pan for 5 minutes and then transfer the baking sheet to the freezer for 15 minutes to cool completely. While the red velvet cake is cooling make the white cake mix according to package instructions. When the red velvet cake is cooled, remove it from the freezer and using a small heart cookie cutter, cut out 24 heart shapes. Line your cupcake tin with cupcake liners and then spoon about a tablespoon of white cake batter into the bottom of each and then add the rest of the batter to a gallon ziploc or piping bag. Gently press a heart into the center of each liner. Don’t squish it! And carefully pipe white cake batter around the heart until the liner is about 2/3 full. Pipe a little bit on top of the exposed heart to protect it from burning in the oven. Bake at 350 for 20-22 minutes or until a toothpick inserted into the white part of the cake comes out clean. Allow to cool completely before frosting. In a stand mixer, beat the softened butter and cream cheese until well blended and creamy. Add the powdered sugar 1/2 a cup at a time until the frosting reaches a creamy, pipable consistency. Add the vanilla and mix until combined. Frost the cupcakes with a star tip, top with a chocolate heart, and enjoy!